Having a business that you really love for me is a key ingredient for achieving success on your terms. Different people have different definitions of success, and if you’re starting or running your own business, it can be a fantastic experience as long as you feel passionate and fulfilled enough to stay motivated and persevere, especially when times are more challenging, as of course most businesses have their ups and downs. I have had my business for eight years, and I’m so fortunate that it’s been a really fantastic experience, albeit stretching at times. I’ve shared my story here in this vlog #1, How to Start and Grow a Business You Love, which I filmed at the beautiful Fountains Abbey in North Yorkshire on a lovely spring day earlier this year. Look out for the cameo appearance of Paddy the Frenchie! I started my company because I was working at the time for East Coast Trains, and had what, for many people, in the UK rail industry, was seen to be a really prestigious, almost dream job. My role was Deputy Managing Director of East Coast, and the company, which then became Virgin and is now LNER, runs trains from King’s Cross in London, all the way up the East Coast to Scotland. It was a really big job, with hundreds of people in my team. The people were amazing, the company was great, but it wasn’t really what I wanted to do. I felt I was putting in so much work, very long hours and sometimes seven day working weeks, and I knew it wasn’t what I wanted to do going forward. So, I did what for me was a very brave thing. I resigned. I decided I was going to jump off, and start my own business, which is what I did. That was where the business I run today was born, and I haven’t looked back since. The purpose of this article, which is the first in a series that I am going to be doing regularly, is to share with you some of the things I have learnt on the journey that can really help you to accelerate your business journey to achieve your next level, whatever it is you want to do, and wherever you want to take your business. Photo: Fountains Abbey, near Ripon. Credit: Jo North. The first of the tips is to know what it is you want to do, and be really, really clear about that. Be clear about what your Unique Selling Point (USP) is, and able to define and leverage your competitive advantage. 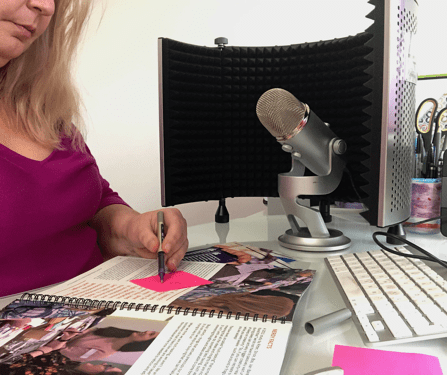 If you’d like to create or update the USP for your business, I have a free downloadable playbook here in Blog #014 that’s designed to help you do just that. If you are offering a product or service that already exists in the market, remember that how you do it is different, and that’s what matters. The personality, focus, customer experience that your business brings will be what helps it to stand apart from your competition. However long you’ve been trading for, it’s also important to take some time to really stop and think. Many of my clients have been in business successfully for 5, 10, 15, even 20 or 30 years, and their companies have evolved a lot over time. This is absolutely fine, but customers, markets, technology, competitors all change, and it’s very healthy to check in with those changes and continuously adjust your business to make sure that the focus continues to be on what makes it special. Just as important is to be super clear on what your business is NOT about, so that you spend your time working on the right things, that are going to take your business in the right direction, and not be investing time, money and effort in things that generally are not going to matter in the long run, or even worse, be a distraction and slow your growth. Having a clear vision for your goals, what you want to achieve, and what success looks like for you creates a compelling motivator and compass. There is nothing more disheartening than working really hard and then feeling like you should be celebrating when you have achieved something, only to find out that actually when you get there, it wasn’t what you wanted in the first place. Understanding yourself, and understanding what meaningful success looks like for you, is really important, so that you can focus your efforts, and make sure all your actions achieve all the success you are looking for. My next tip is that there is always a way to get things done and achieve the things you want. And sometimes it takes more than one go, often several! Beware the proliferation of examples on social media where entrepreneurs are claiming to have achieved incredible success by implementing an easy six-step formula, following a certain plan or set route. The reality is that success route for every business is different. So, you have to find out what works for you, and sometimes that means failing a few times. Sometimes it means not getting it quite right, and sometimes it means some experimentation. That is all part of the process. (Thomas Edison, inventor, was a master at trying over and over until he succeeded). Please don’t think when you read all the glossy accounts of how people have achieved a multi-million turnover business overnight just through their ‘simple steps to success’, that that is the case for everybody, because it absolutely, definitely isn’t. It takes hard work, failing fast and forward, and learning. Tip number 4 is all about customers. I see so many business ‘experts’ on the internet speaking about how important it is to have clear boundaries, to manage time, make sure that you are maximising all those possible revenue opportunities and charging for everything. Up to a point I agree with that, but with a humungous caveat. Customers are obviously the lifeblood of any business. My strong, unwavering ethic is to proactively look for opportunities to absolutely go the extra mile for your customers, especially your most valued ones (and I don’t just mean the ones who spend the most with your business). My perspective is that my customers are people who are doing the best they can with the situation they are in, and if I can offer additional help and support without compromising my business or my other customers, then I will. That really is so important because of course highly engaged customers will recommend you to other customers. They are more likely to buy from you time and time again, and you will be more able to develop long lasting relationships. Tip number 5 is about leveraging your business network. They may be skilled in different areas from you, and that is really helpful. You can leverage each other’s skills, maybe introduce them to your clients and vice versa. When you have got a network of people who you can count on, who you can really trust, it can feel very supportive. Other entrepreneurs will be going through or have been through similar things to you, even if they are in a completely different sector. You will find others who have gone through experiences such as growing pains, finding the right people, and keeping those people engaged and motivated. They may have had similar client issues, or financing challenges. It is so important to spend time with like-minded people. Remember that your performance will increase if you surround yourself with people who are slightly ahead of you, in a similar place, or striving in the same direction. The quality of who we spend time with, from a business point of view, directly impacts on our business. I have been so fortunate to have built a network of brilliant people. They are leaders in their disciplines, and I also love working and spending time with them. These business friendships just bring my business to life even more! With great clients, a great network and a great team it is so much easier to build a business that you love, and stay in love with, for a long time to come, and also be really successful too. Photo: Business networking in action at Idea Time. The Live Experience! February 2019. My final tip is to find somebody who can work with you to keep you accountable and on track. It is so busy running a business. You have got to deliver the day-to-day operation, as well as work on immediate business growth. When we are aiming for something big that goes above and beyond the day job we need to put in extra effort. We need to do things differently and carve out dedicated chunks of time so that we can invest in the future growth and strategy of our business. Having a fantastic coach or mentor, who can keep you accountable, is a really good thing. Find a coach who will go above and beyond for you, be your greatest cheerleader, your biggest supporter, and also who will give you direct feedback. Find someone who, when something is not quite going the way you need it to, will genuinely be there to help you, and coach you to solve your way through it. You also need a coach who will tell you straight sometimes, and that is invaluable. Fantastic coaching support really makes a massive difference, and I know that from my personal experience of being coached. I also know because that is what my clients tell me. They say that the accountability and support that come with my coaching, as well as the business knowledge that I bring, are the things that make a real and significant difference to their progress. These tips are the six core operating principles that I’ve built my business on, and they have served me really well. I hope they help you. I am sure you are using some of them already, although I think it’s useful to pause, reflect and remind ourselves of our priorities. If you’d like any coaching support to help you to accelerate your business, I’d love to hear from you at [email protected]. I’m not into overblown hype, marketing tricks or hopping onto the latest shiny and short-lived trend. Just straight-talking, results-focused and practical advice. No B***S***, just heaps of pragmatic and individual expert support. Let’s set up a call!